A healthier Gluten Free Chocolate Cupcake. 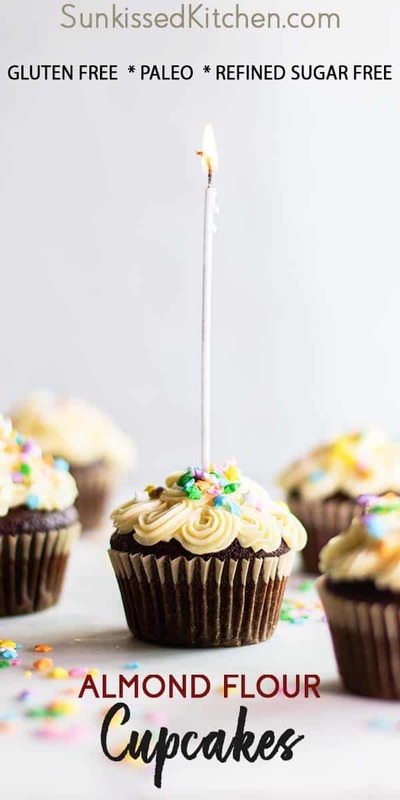 If you’re looking for a cupcake recipe everyone can enjoy that does not taste gluten free, you’ll love this almond flour cupcake recipe. Simple, clean ingredients bake up into a moist, almost brownie-like cake! I don’t shy away from sharing gluten free treats at gatherings. My friends happily eat my Quinoa Chocolate Cake with Sweet Potato Frosting, and I’ve been told it tastes just like “cake and chocolate frosting,” but less sweet and maybe better. 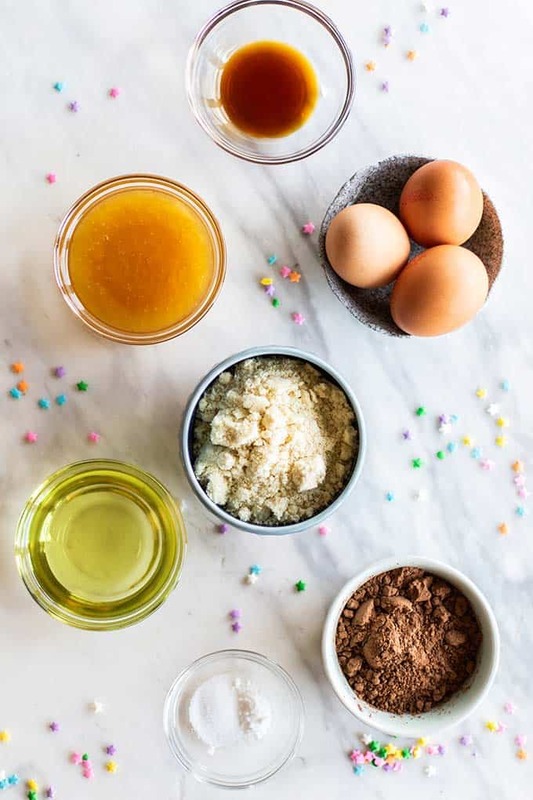 The thing about classic baked goods, whether you’re avoiding gluten or not, is that they are made with refined flours and refined sugars – ingredients our bodies don’t really love, and honestly, ingredients that have had the natural flavors of the food stripped. Baked goods can be made with whole grains or whole food flours, like these almond flour cupcakes. 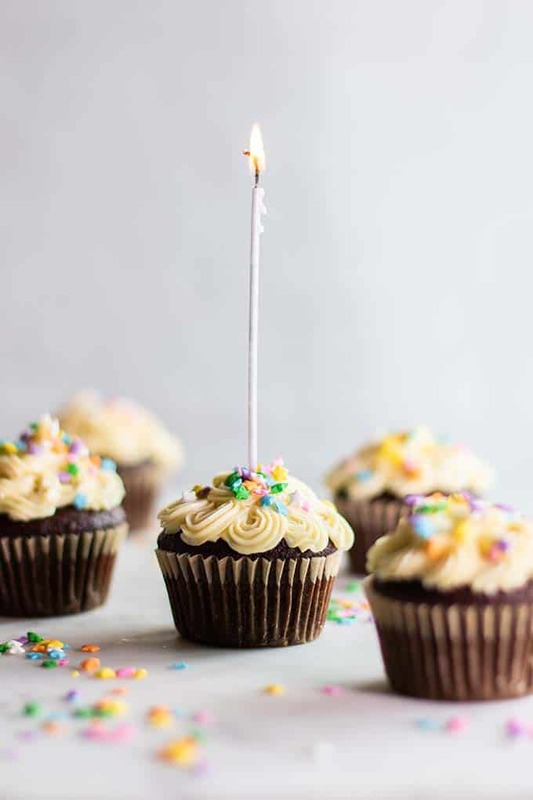 They can also be sweetened with healthier sweeteners — like dates, honey and maple syrup — options that while still being sugar, have natural flavors and also nutrients still intact. But it’s for a special occasion, so why not indulge? 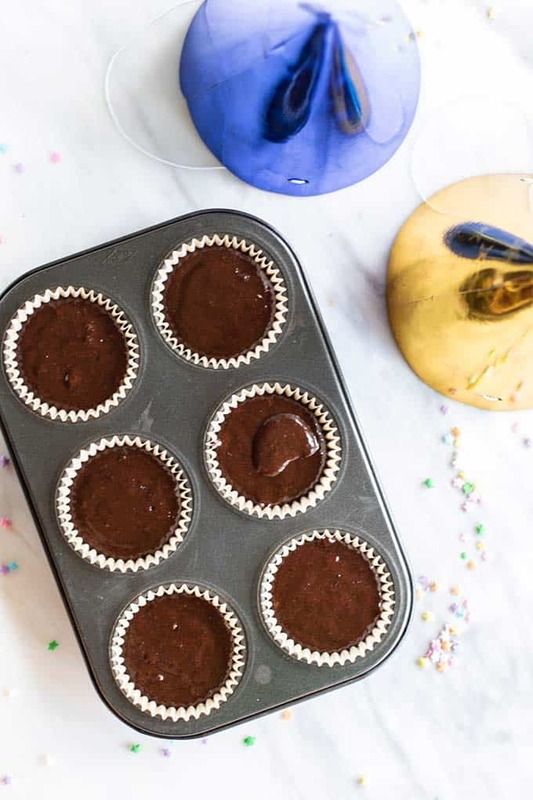 Once you’ve tried this healthy chocolate cupcake recipe, you’ll realize it tastes just as special, but leaves you feeling a lot better! These prove you can have the best of both worlds. Almond flour is my favorite gluten free flour to use. It’s naturally sweet, so I find I need to add less sweetener. It’s also higher in protein than wheat flour, and easily subs without needing to mix several flours, or use starches an gums. 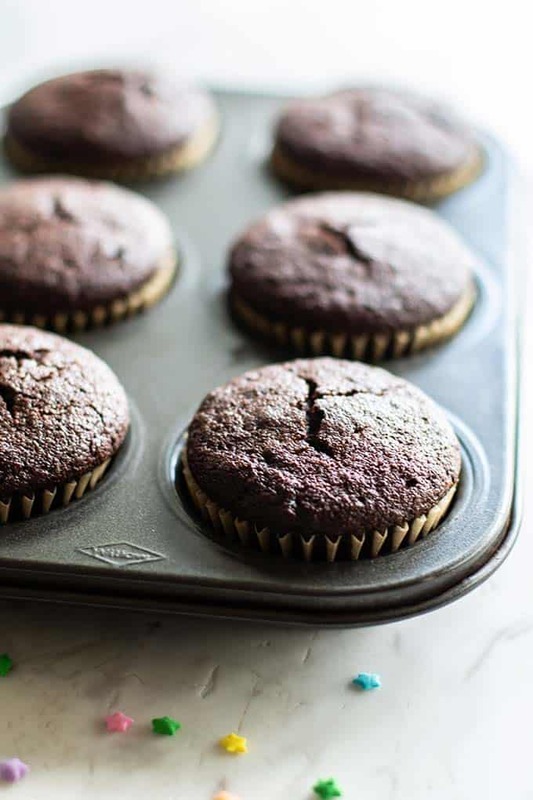 Whisked up in a couple minutes, these healthier cupcakes will be ready in no time! I just can’t get behind foods that are made almost entirely out of sugar. And once you have tried my healthier frosting recipes, you’ll understand there just isn’t a need! These beautiful cupcakes were iced using a new recipe, my White Chocolate “Buttercream”a healthier option that uses no powdered sugar and no butter. If you’d like to go the chocolate-on-chocolate route, try this Healthy Chocolate Frosting — it has a base that will surprise you! 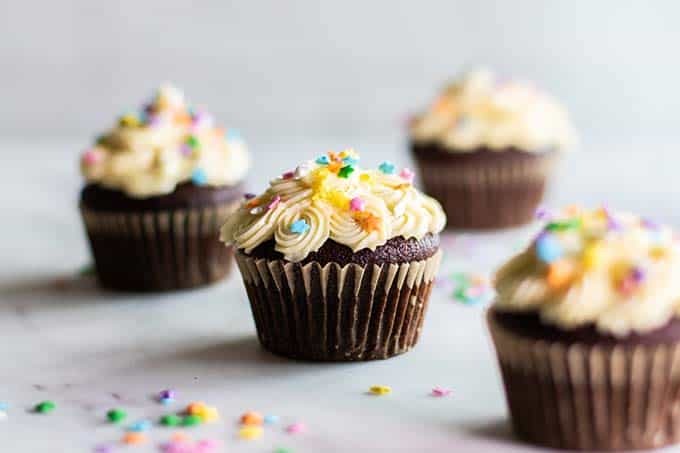 These delicious chocolate cupcakes are full of healthier ingredients, but moist, rich, and fudgy. 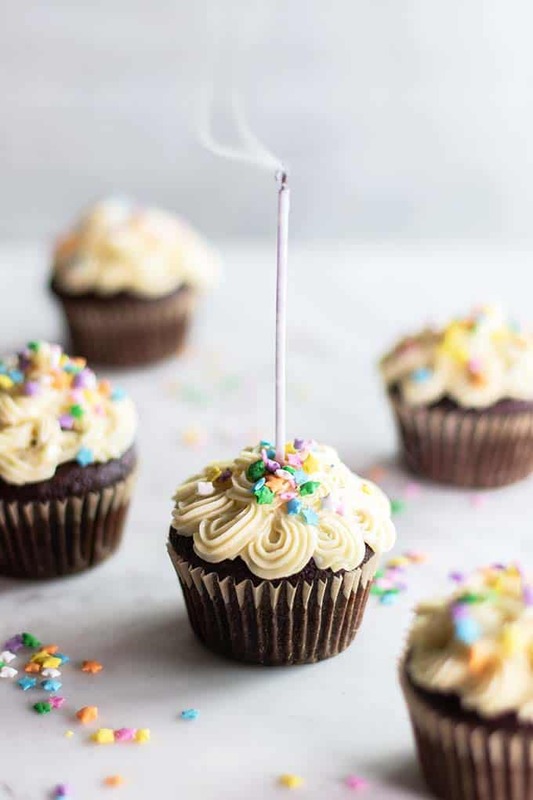 Sure to be your new favorite cupcake recipe! In a mixing bowl, add oil, honey, eggs, vanilla, salt and baking soda. Mix well until combined. Add the almond flour (sifted, if needed) and cocoa powder, and stir until combined. Line a 6 cavity muffin pan with liners. Divide the batter into 6 cupcakes. Bake for 24-27 minutes, until the centers are fully cooked. Frost with white chocolate buttercream, and decorate simply with sprinkles. 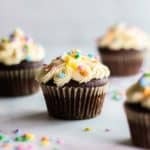 This gluten free chocolate cupcake post may contain affiliate links, meaning if you make a purchase, I will receive part of the sale as a commission. This helps me continue to bring you lots of fresh and inspired recipes!